Upgrade your online portfolios and personal websites with this collection of ready-made Joomla themes and templates. Every creative and other business professionals should have their own web portals if they wish to boost their visibility and create an online presence that will surely help them achieve success. A professional portfolio in the World Wide Web is a great way to showcase your works and highlight your skills, especially nowadays as more people are trying to keep up with the latest in technology. And that means you shouldn’t let your business get left behind. 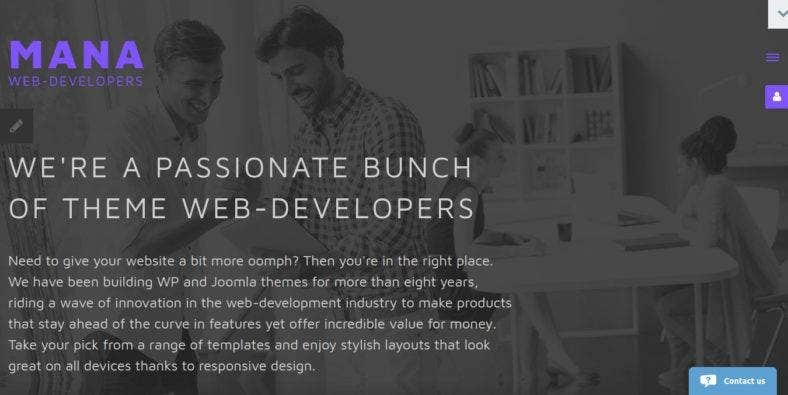 Below are some of the best Joomla themes and templates out there which we have carefully selected and curated to help you jump start your personal or corporate business online. We guarantee that these templates are easy to use, extremely customizable, and ultimately responsive to give you a visually stunning as well as a highly functional website. So, what are you waiting for? Dig in and choose the template that suits your taste and business needs. To start with, here is Mana. A responsive Joomla theme that is made especially for web developers. 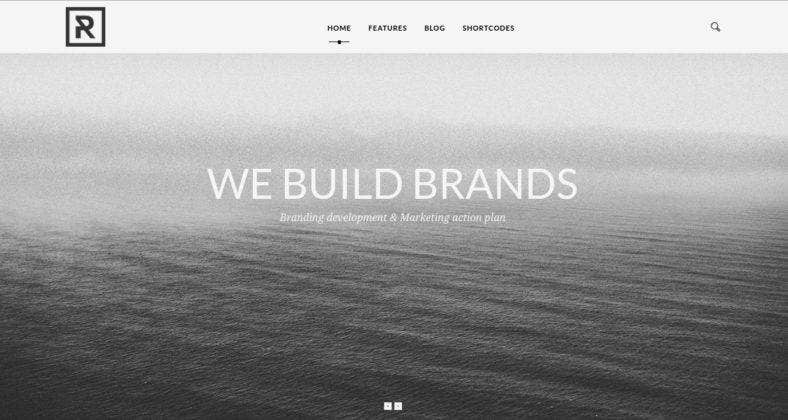 Its minimal yet eye-catching style intends to keep the focus on its content while web developers showcase their expertise. 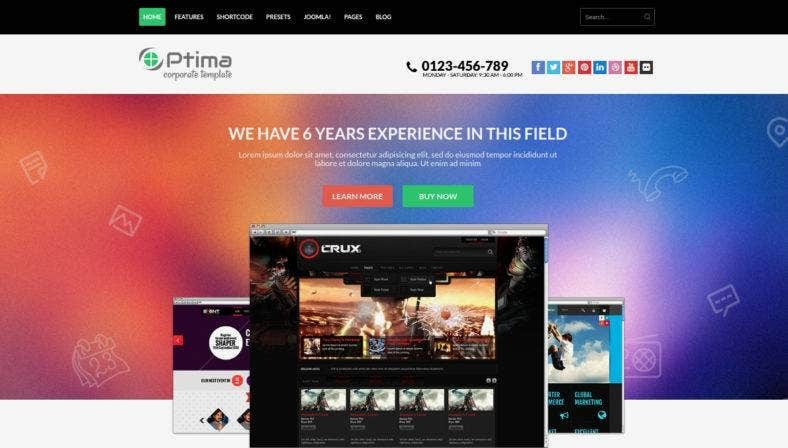 The theme also comes with a sleek and modern layout that is highly customizable through the advanced admin panel, theme color switcher tool, additional pre-designed pages, various UI elements, and much more. A responsive business portfolio template, Ufolio is used to create portfolio pages for different types of businesses such as corporate, agencies, startups, and small businesses. This Joomla theme is characterized with a simple and professional design over a striking imagery that will surely encourage potential customers to avail your services. It is also integrated with a powerful smart blog where you can post notes with images, audio, video, and galleries. Next is Material, a responsive Joomla template for web professionals like web designers. It comes with a modern and well-structured interface giving you the best way to showcase your works to the world and promote your web design services to eager clients. This template is designed with the latest trend, Material Design which incorporates the classic principles of good web design with innovations and possibilities. It comes with 14+ pre-designed pages that you can choose. 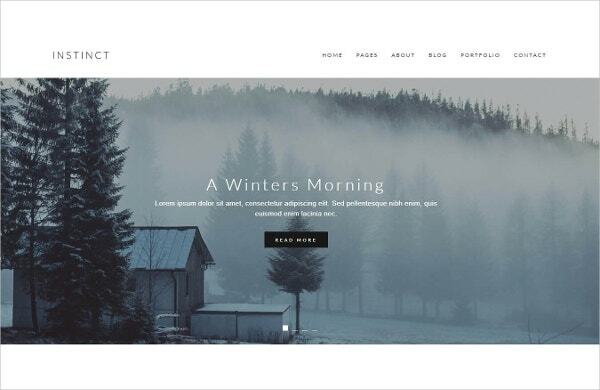 Scrollite is a responsive one-page website theme with a unique layout builder, full-width content slider, smooth scrolling capability, and excellent portfolio styles. These are just among the amazing features this template is attributed by. This Joomla theme is perfect for marketing your web and mobile apps products as well as any creative, non-profit or general businesses. It is easy to customize and featured with many awesome Joomla extensions to rock any content. 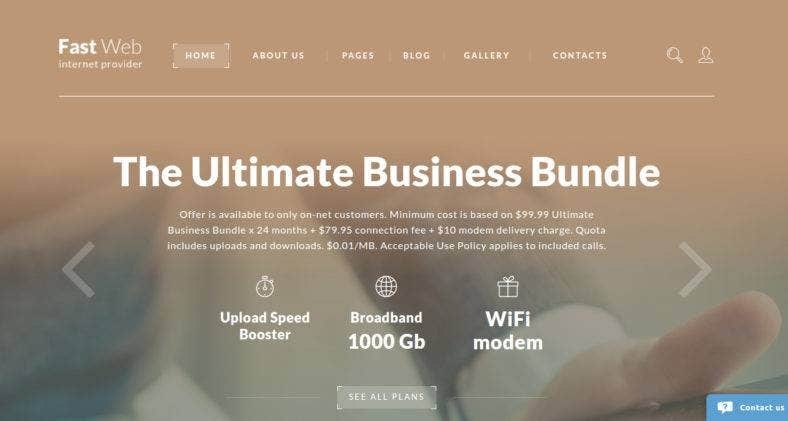 Fast Web, on the other hand, is designed with a gradient color scheme along with a full-screen background to give your internet provider business a dynamic and appealing website. Although its look is not techy and edgy as expected from tech blogs and websites, this beautiful aesthetic suits well with with the futuristic concept. Design wise, the company services are arranged in a grid structure and a subsidiary menu is found at the footer of the web page. Another responsive Joomla template built to help you build a creative website or portfolio online for designers, photographers, and other creatives. 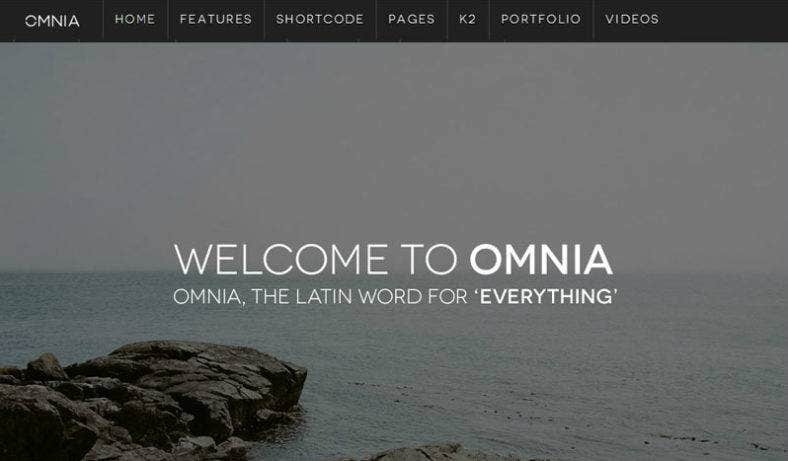 Omnia offers a clean and professional design with a fullscreen homepage to attract visitors and viewers to your site. Loaded with tons of extensions and features such as the Revolution Slider, unlimited parallax modules, an intuitive administration panel, and more; this theme will surely give you a creative edge. 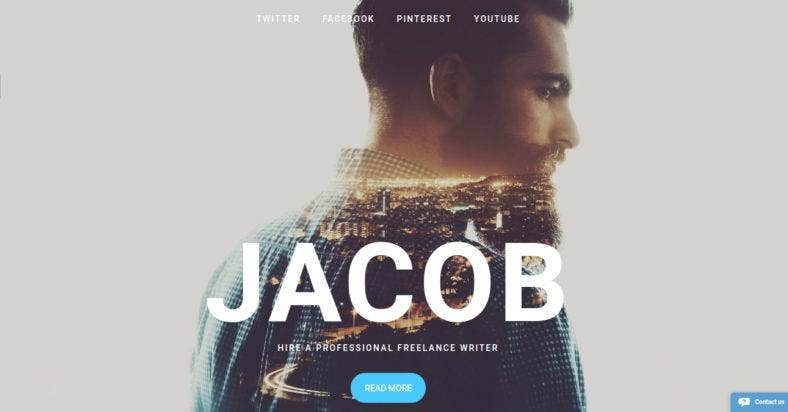 A gorgeous portfolio template for any freelancer, whether you are a copywriter or a web designer; Jacob presents a visually striking aesthetic like no other. Simple and minimal in its design, it doesn’t shy away from featuring a number of robust attributes such as Advanced Theme Options, Alternative Module Layouts, Dropdown Menu, Social Options, Sortable Gallery, Google Web Fonts, and Crossbrowser Compatibility among others. Tripod is a portfolio website theme for photography with a flat and gorgeous design perfect to showcase your photography, art, and commercial products. It features a single-scrolling capability which is an ideal way to display your content and navigate the site easily. The theme is fully responsive and optimized for mobile navigation. It comes with 8 different color palettes and beautiful demos making sure it gives you the template that you want. 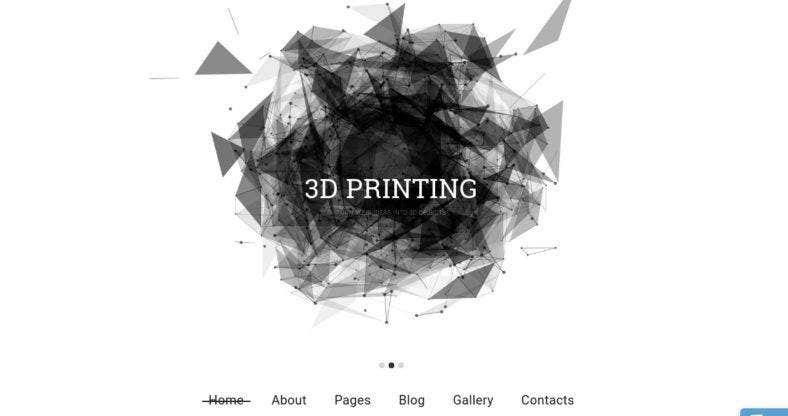 The above theme is built with 3D printing and other printer services in mind. This clean and minimal Joomla theme can be used to present your best 3D projects and services to a wider audience. It comes with lots of awesome features such as the header slider to grab your audiene’s attention, a stick-to-the-top menu for ease in navigation, a theme color switcher to customize that theme according to your preferred color, additional pages and UI elements. 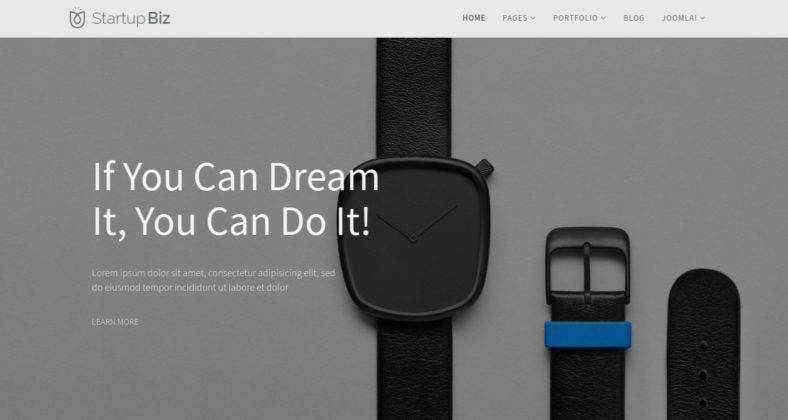 Okno is a multipurpose website template built with the effective Joomla framework. With a clean and modern design, it comes with a number of demos that fit various business niches such as blogs, events, restaurants, health care, apps, and even personal websites. It features the TZ Portfolio Plus with add-ons and template style, Hikashop, K2, JSN Uniform, SP Page Builder, EasyDiscuss and many other TZ Modules. Highly responsive and easy to use. 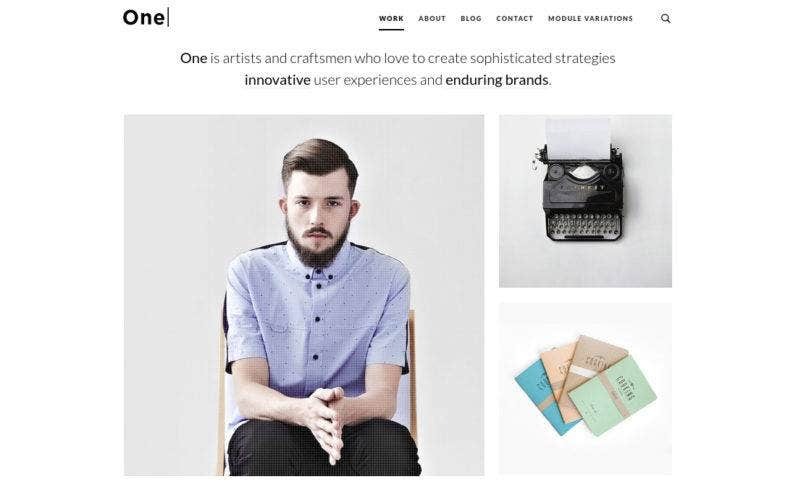 One is an ultra minimalist website theme that is characterized with lots of white space to provide the spotlight on your works. Its clean and modern layout makes this theme great to use for online portfolios, a creative’s personal page, or an agency’s website. With a very clear homepage in stunning effects, this theme is built with the latest web design trends in ultimate sophistication. It is also fully responsive, so it sure looks good on all devices. An amazing personal portfolio theme to begin with, Nakoi provides an unconventional but totally efficient template for your graphic design portfolios and websites. Based on the latest version of the Joomla platform, this theme is as flexible as it can get with Helix Framework, ZOO component, 960 grid system based on bootstrap, responsive slider fully built with LESS CSS. 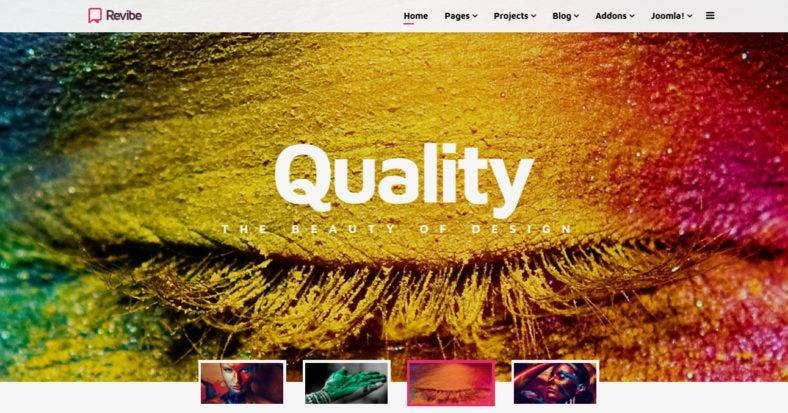 Loaded with these attributes, you are sure to create an amazing portfolio website. 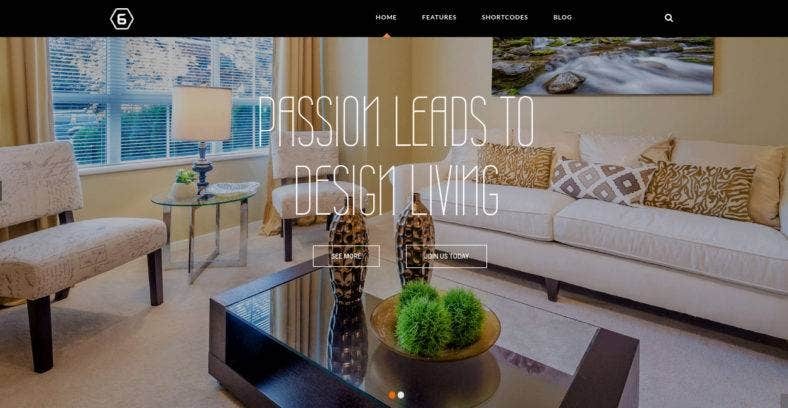 An interior design Joomla template, this responsive portfolio theme is built on Zo2 Framework and comes with additional Joomla extensions such as ZT Twitter, ZT Portfolio, Easyblog, and others. Six is perhaps the right theme to use in building up your own portfolio website for furniture, outfits, jewelry and so on. This stylish template also features a smooth homepage with many scrolling up layers, a full-width slider and awesome 3D effects. Startup Biz is a drag-and-drop website template made for Joomla. This multipurpose theme is created with a modern and versatile design that will surely present your products in a way that will help your business achieve its goals. Made with an awesome design and exceptional functionality which includes the SP Simple Portfolio and SP Page Builder extension in order to let you to show off your latest projects, products or ideas and highlight your creativity. 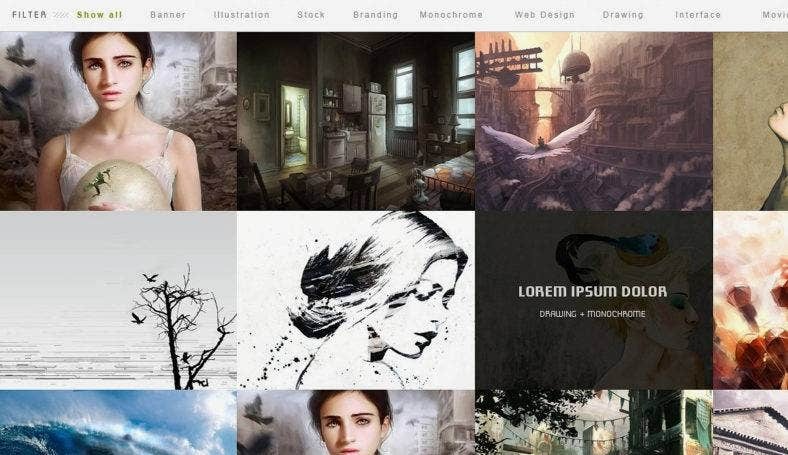 This artist portfolio Joomla template is characterized with a flat design which makes this theme modern and creative. 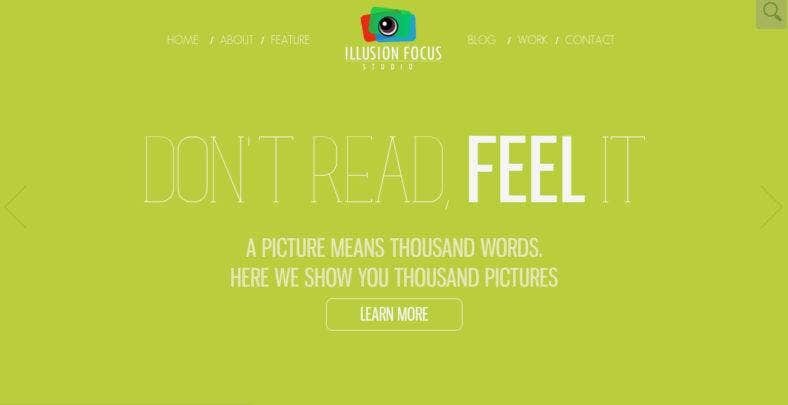 Focus comes with an artistic aesthetic that works well with any art-related websites like logs, galleries, exhibitions, and more. Fully equipped with Bootstrap, HTML5 & CSS3, K2, Mega Menu built-in and social network tabs; the theme will help you build a parallax scrolling layout and make your works stand out from the rest. A responsive multipurpose Joomla theme that works well with, if it is not created specifically for product design portfolio websites. It’s highly creative aesthetic makes this theme undeniably eye-catching and attention-grabbing, giving your business a very great advantage over competitors. Packed with cool features such as the powerful drag-and-drop SP Page Builder Pro along with 40+ add-on elements and options for high customizability and flexibility. This fun and and interesting Joomla theme comes with a variety of colors, attractive layouts and impressive displays of images to help you create a stunning websites that is suitable for many purposes. Leo is a responsive website template made especially for business websites, eCommerce stores as well as creative portfolios. With this theme, you will be able to display your product in a professional way and in an exciting manner at the same time. Aspasia is another responsive Joomla theme made for small business’ portfolio websites. It is a clean and stylish template with a multi-concept and multipurpose design. Built with powerful Helix3 Framework, this theme comes with a pre-designes page templates which support lastest version of HikaShop, K2, AcyMailing and is easily customizable with SP Page Builder tool. It is fully responsive and looks great on all devices of every screen resolution and sizes. The beautiful digital art portfolio theme you see above comes with a grid-based style layout which displays your digital artworks and projects and helps them attract attention. 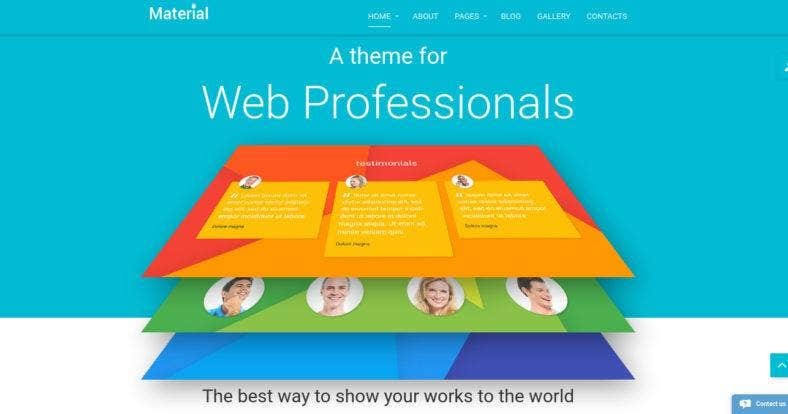 Digital Pixel is a design and marketing Joomla template with an intuitive interface that allows you to update information on every project easily. It supports Rich Snippets, is responsive with a lightweight design, and comes with the best Content Management System in the world. This premium Joomla template is designed and created for portfolio, blog, resume and personal websites. 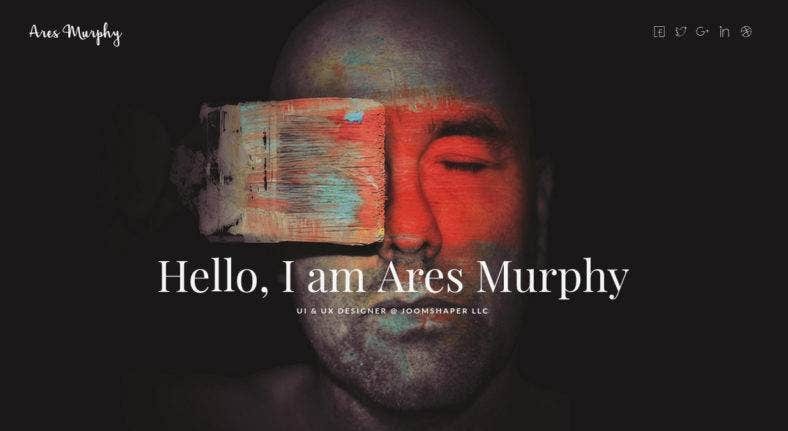 Ares Murphy is a well-designed, creative, responsive and multipurpose theme that perfectly works well with designers, developers, bloggers, photographers, and graphic/UX experts. It includes five different built-in template variants, you can choose the perfect theme for your business niche. It is extremely customizable with lots of features and options. Retro is a marketing Joomla template that can be used for advertising agencies, creative firms, and corporate businesses’ websites. With a clean and simple design, it exudes class and sophistication that is perfect to build a professional aesthetic. This theme boasts of its many awesome features which include a responsive web design, a drag-and-drop layout builder, HTML5 and CSS3 animations; and is integrated with EasyBlog and Font Awesome Icons. 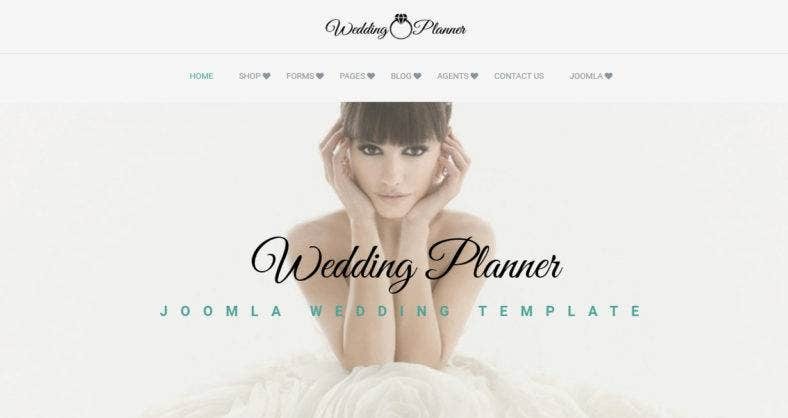 For wedding planners and all wedding services providers, this is the perfect Joomla template for you. With a carefully thought-out and well-balanced design, a pre-made demo version is available where wedding products, decoration services, and other wedding essentials are arranged in a way that captures the hearts of soon-to-be-married couples. It also comes with a VirtueMart online shop, BaForms, a responsive image gallery and much more. Leena is a responsive portfolio Joomla template with a simple and clean design incorporated with solid bold colors for more apperal. The theme comes wit tons of great features and many powerful modules to work seamlessly accross devices and browsers as well as to monitor and improve your website’s performance every now and then. Perfect for graphic designers who offers marketing and branding services to companies and businesses. 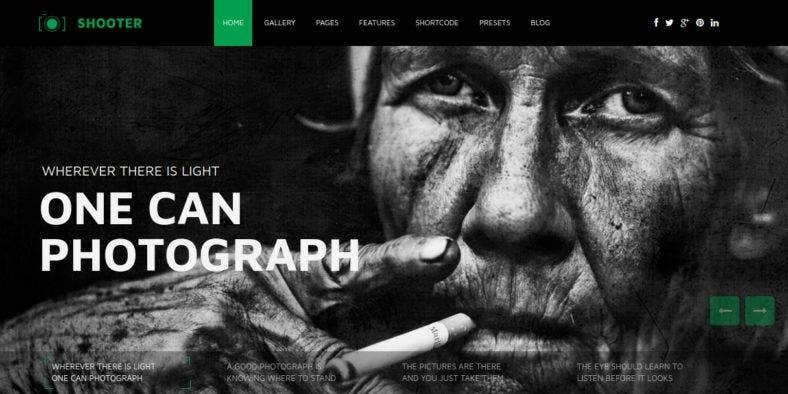 Shooter, on the contrary, is a dynamic and powerful portfolio website template that provides any street photographer and every photo enthusiast the perfect avenue to showcase their stunning and gorgeous photographs. This photography Joomla theme comes with the perfect layout that will help promote your photo gallery in very creative and professional manner as it uses a JQuery masonry plugin with an easy photo management drag-and-drop system. Dance is undoubtedly one of the best creative expression and the greatest way to entertain people. Dance crews are gaining popularity nowadays and in order to boost this, you need Heartbit. 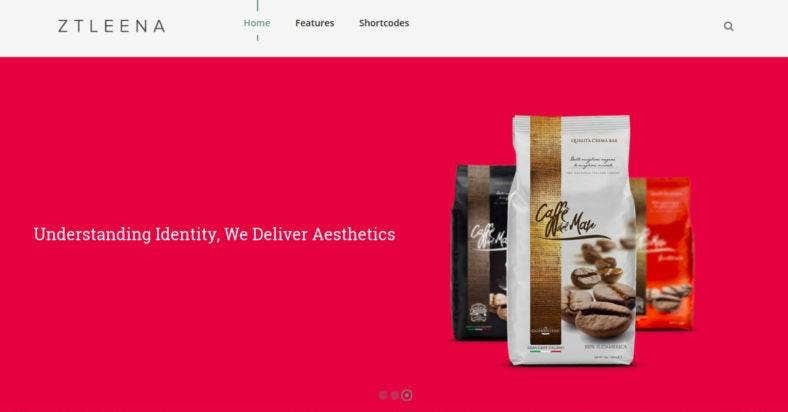 Although designed to be minimal and stylish, this creative Joomla theme allows you to showcase your talents in a strong and bold way through large images and videos. It features OS Touch Slider, simple OS Responsive Image Gallery and working contact form. To end this list, we present Optima. This responsive and multipurpose Joomla theme is an incredibly creative and professional template suitable for company and corporate portfolios. Loaded with a bunch of modules used to handle all dynamic functionalities like testimonial, team members, services, portfolio, timeline; this theme also comes with 6 stunning presets and 6 ready pages to help you create a beautiful and working website on your own. All in all, this collection of Joomla themes and templates are presented to you to serve as a go-to resource for all your website needs. We have made sure that each and every theme on this list comes with great features to provide your portfolio website the ultimate functionalities. And with a choice of template for every business and creative niche, there is no reason for anyone to miss out on this opportunity. 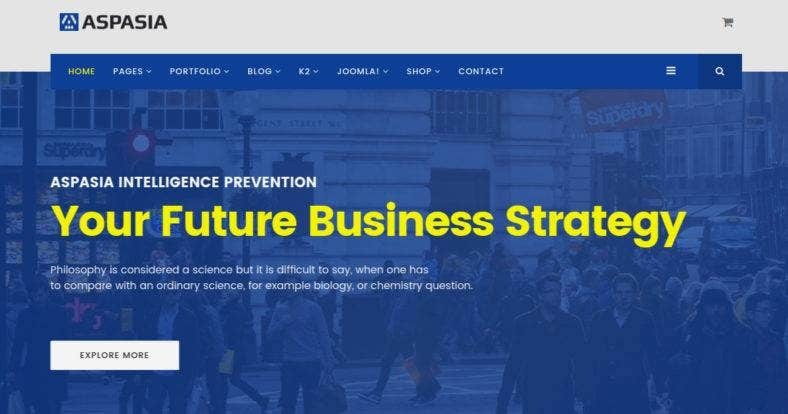 For more ideas and inspiration, you can check out and follow our list of new Joomla templates of the month.